“I thank my God every time I remember you. In all my prayers for all of you, I always pray with joy because of your partnership in the gospel from the first day until now, being confident of this, that he who began a good work in you will carry it on to completion until the day of Christ Jesus” (Philippians 1:4-6, NIV84). It is a joy to be your pastor. If I had to sum up 2018 in one word, it would be “healthy.” When I look back over the last twelve months and read the other reports in these pages, I’m encouraged at how healthy our church is. 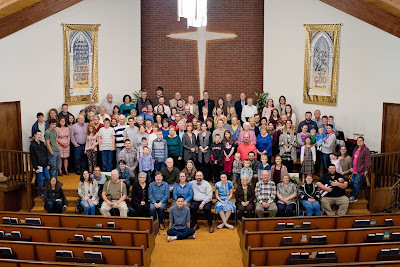 We have lots of room for improvement, of course, but our church family, on the whole, is happy, holy, and healthy. There is lots of love, respect, and concern for one another. We have worked well with one another to reach out to our community. Our worship is joyful and God-centered. Our teaching is focused on the Bible and how it applies to daily life. Our leaders lead with wisdom. Volunteers serve faithfully and with joy. New people are coming. Disciples are being made of people in all ages and stages of life. One could always desire more (and I do! ), but this shepherd is very satisfied with how healthy his flock seems to be. I’m particularly grateful for our 2018 Elder Team–Bob Gisewhite, Cody Crumrine, Keith Folmar, John Forcey, Joel Michaels, and Jeff Schiefer. They put in many quiet hours behind the scenes, making decisions, establishing policy, shepherding people, and providing wisdom, accountability, and direction for me. Their leadership is a big reason why our church is so healthy. Another person who helps us stay on track is Marilynn Kristofits through her cheerful “ad-ministry” of details. Marilynn completed her fifth year running our church office in 2018. I wouldn’t want to know where we’d be without her! I believe that prayer is one of the biggest reasons why we are so healthy right now. People gather to pray weekly at our Prayer Meeting on Wednesdays, people show up to pray for the lost monthly at our Harvest Prayer Times, and people pray wherever they are whenever they receive a prayer chain email. I’ll be forever grateful for the prayers of the Pastoral Prayer Team who pray especially for the things my family and I are facing throughout the year. God is answering prayer. Our attendance at worship holds pretty steady. Our average Sunday attendance in 2018 was 132 people per week (down from 135 the previous year). The highest attended service was Resurrection Sunday with 237 people (the exact same number as last year!). The lowest attended Sunday (100 people) was July 1st when the youth group left to go to the Challenge Conference. We received three new members. When I was presented as the candidate to be your pastor almost twenty-one years ago now, I explained that I envision biblical pastoral ministry as coming under three major headings: preaching, equipping, and shepherding. These are some of the highpoints from 2018. The Gospel of Matthew was our focus on Sundays for the entire year. Step by step, we progressed from chapter 2 all the way to chapter 13. Studying for and preaching through Jesus’ Sermon on Mount was one of the richest experiences I’ve had in my two decades as pastor. I look forward to continuing through the Gospel of Matthew this year. We also went down a number of side-roads along the way with special messages on the image of God, the Holy Spirit, the life and ministry of Billy Graham, Psalm 118 and its relationship to the Triumphal Entry and the Resurrection, our twentieth pastoral anniversary, Proverbs for Family Bible Week, and the joy of Christmas. In 2018, I also had the opportunity to share from God’s Word at the Miracle Mountain Ranch Father & Son Retreat, State College’s Oakwood Presbyterian Church Women’s Leadership Retreat, Hope Evangelical Free Church in Fertile, Minnesota, and our very own MOPS group. Whenever I wasn’t in the pulpit at LEFC, we were served the Word from able guest preachers: Abe Skacel, Peter Bors, Donnie Rosie, Daniel Stanley, and Joel Michaels. It’s not glamorous, but I enjoy working alongside our leaders to accomplish our ministry goals. Every month, I get to go to meetings, send lots of emails, make phone calls, and try to ensure that all of our people and programs are fully resourced and equipped. One part I especially enjoy is helping church leaders review and improve their ministry. This year, our various ministries added quarterly men’s breakfasts, updated our missions ministry policy, planned out a new children’s church class, provided for online giving, and prepared for a new “prayer corners” initiative which should begin soon. I continue to have an equipping ministry that extends beyond our local church. In 2018, I remained the chairman of the Allegheny District Constitutions and Credentials Board, directed the district Stay Sharp theology conference, and served nationally on the EFCA Spiritual Heritage Committee. I also continued as the book review coordinator for the national EFCA blog and maintained my own blog that provides resources such as sermon manuscripts, book reviews, and updates on the ongoing ministry of my book, Resisting Gossip. What a sweet privilege it is to be a people-shepherd and be invited into some of the most precious times in your lives, both happy and sad (Romans 12:15). I get to visit with you in your homes, your workplaces, or maybe a local restaurant. You stop by my office. I stop by your hospital room or watch your sporting event. I love being a pastor. In 2018, I got to help dedicate four babies: Branda, Quinn, Bowden, and Anna. I got to baptize three believers: Haylee Shimmel, Keith Hurley, and Dottie Isaacson. I had the joyful privilege to officiate the wedding of Sheila (Allen) and Benjamin Hutchinson. I also had the solemn privilege to lead funerals for my great aunt Vaughn Pierce, Donald Beveridge, and Carolyn Dobo. Last year, our vision was drawn from Matthew 4:19 – following Jesus and fishing for Jesus. In all that we do, we are called to make disciples of Christ – first reaching and then growing followers of Jesus in every area of their lives. This year, my vision is simply to keep it up. Our church is healthy, and it’s my goal to keep it that way. We are headed in the right direction, and I want to continue to shepherd us to stay on that faithful path. I’m not calling for stagnation or getting stuck in our ways. Keeping it up will require change. We will continue to review all of our ministry strategies and make course adjustments as needed. There is more to be done, more than can be accomplished as the Lord leads. But I do hope for more of the same focus on bringing people into a life-changing relationship with Jesus Christ through worship, instruction, fellowship, evangelism, and service. It may get difficult. There will be challenges, foreseen and unforeseen. We have enemies in the world, the flesh, and the devil. Keeping it up will require sacrifice and self-denial. Our Lord says, “If anyone would come after me, he must deny himself and take up his cross and follow me” (Matthew 16:24). That sounds painful. But He is worth it. May He find our church healthy and faithful.